The Honda CB550 was probably the best balanced Honda of the seventies. It did not have the awe-inspiring power of the legendary CB750, but it had a stiffer frame and was a lighter and more nimble motorcycle. 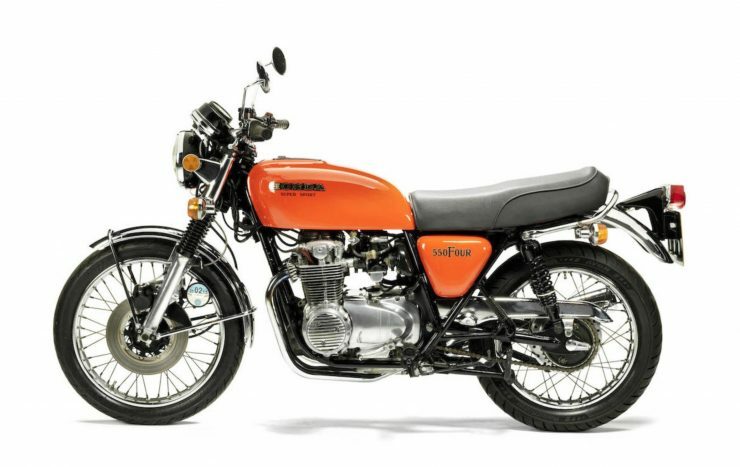 We might describe the Honda CB550 as Honda’s “Goldilocks bike” – the CB750 was too big and powerful for many, the smaller bikes such as the CB360 and CB400 were too small (and the CB360 was not particularly stable as you got it up into its top speed range). But the CB550 was just right. The Honda CB550 was introduced in 1974 and remained in production for five short years until 1978. The CB550 was in some respects a “bug fix” model descended from its predecessor the CB500 and made to not only improve on power but to remedy the technical faults that had dogged the CB500. 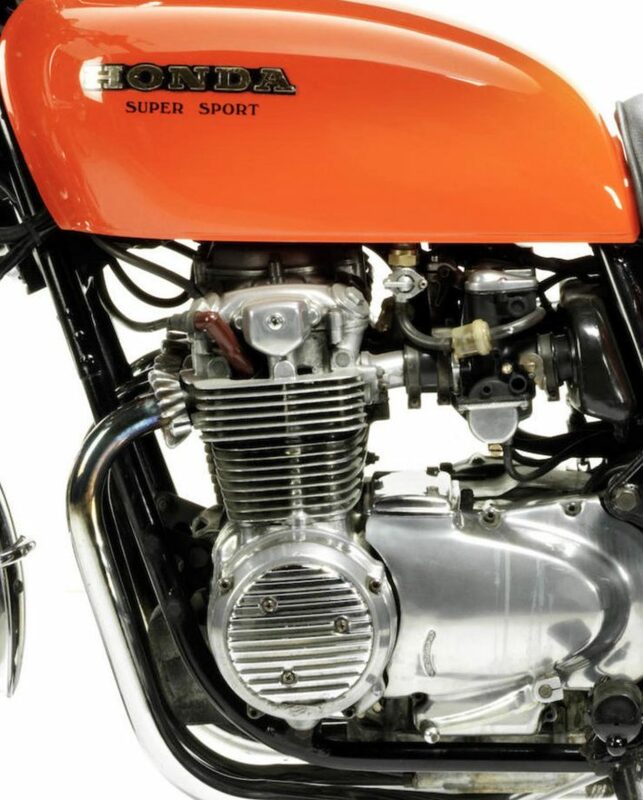 The engine of the CB550 was the same power plant as fitted to the CB500 but with its capacity increased to 544cc (33.2 cu. in.) lifting its power to 50 hp at 8,000rpm with torque of 30.4 lbf.ft at 7,500rpm. 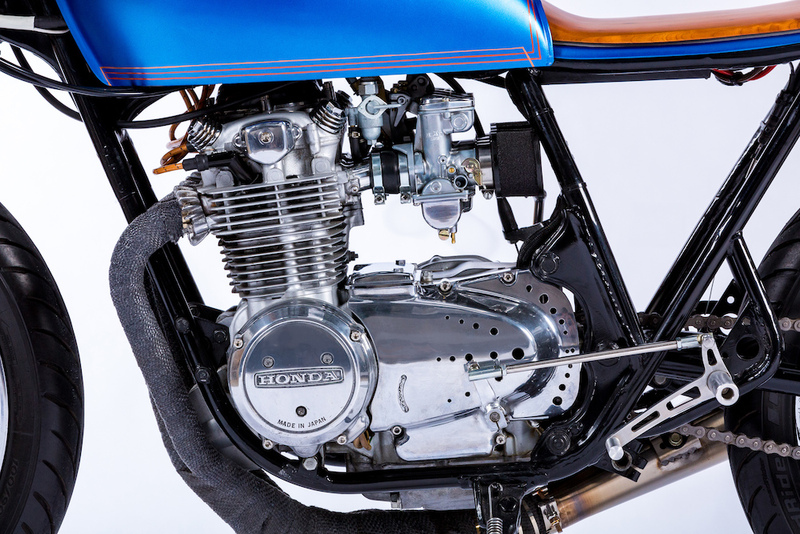 The engine breathed through four 22mm Keihin carburettors in typical Honda style. The engine’s compression ratio was 9:1 which means it preferred the leaded “super grade” gasoline of the time. The engine was a typical Honda in-line four cylinder with single valves (i.e. 8 valves) and a single overhead camshaft. This engine was mounted transversely in the frame and made as a unit with the five speed transmission. That five speed transmission remedied the gear change problems of the CB500 and was nice and crisp to use. The clutch slipping bug of the CB500 was also fixed in the CB550. As this engine was significantly lighter than that of the CB750 the handling of the CB550 was livelier, and it was a much easier bike to ride. The frame of the CB550 was a steel cradle type with twin down-tubes. It was a stiff frame well engineered for the weight and power of the bike and contributed greatly to the bike’s handling. The 35mm front forks were a telescopic free valve type whilst at the rear were twin shocks with adjustable pre-load. Brakes of the CB550 were a single caliper single 11” disc at the front and a drum at the rear. The brakes worked well. The seat was set at a height of 31.7” (805mm) making this a good choice for those of us who are not 6′ plus. 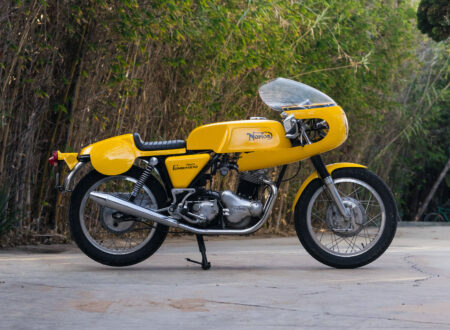 This relatively low seat height combined with the modest weight (wet weight of 423lb/192kg for the CB550K and slightly less for the “Super Sports” CB550F) made this an attractive motorcycle for newer riders as well as for those looking for a lively and fun road bike. Wheels were 19” x 3.25” front and 18” x 3.75” rear and the wheelbase was a comfortably long 55.3in./1,405mm. 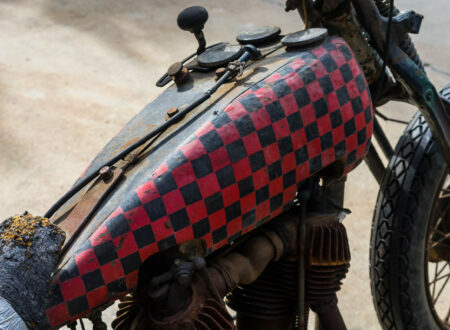 The fuel tank held 3.7 US gallons (14 liters) and on some later models of the CB550K and all models of the CB550F featured a filler that lurked under a key locked flap on top of the tank. It worked well enough and provided some security but not everyone liked it. The claimed fuel consumption was between 40-50 miles to the US gallon. In real world road tests however the CB550 tended to deliver in the low forty miles to the Imperial gallon and down to 38mpg (Imperial gallons) if pushed hard. 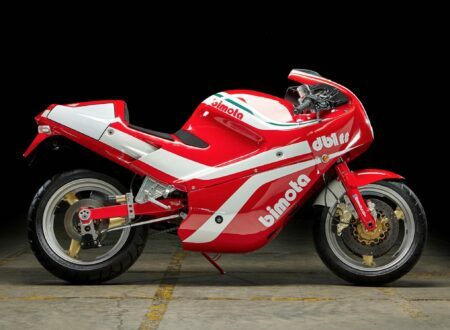 This bike would happily sit on 70mph at a comfortable 6000rpm in fifth gear and had a top speed north of 90mph with some claiming the bike could just make the ton (100mph). For those of us who think that 70mph is a nice comfortable cruising speed the CB550 would sing along the highway, the rider being aware of the high frequency buzz of engine noise that would make its way through the helmet, but the buzz was certainly not accompanied by vibration. On long trips the seat could leave something to be desired and has been described as being a bit “bum numbing”, but there are not a lot of motorcycles that don’t fit that description. The CB550K was the first of the two models of the CB550 and was made in the style of the CB750 of the same time. 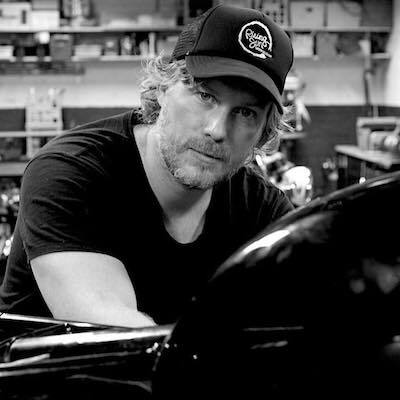 Riding position was “sit up and beg” and the exhaust was split as two into one on either side. CB550K0 (1974); Flake Sunrise Orange, Boss Maroon Metallic, and Freedom Green Metallic. The tank color scheme was two tone with a black panel outlined in gold on the side of the tank. CB550K1 (1975); Candy Jade Green and Flake Sunrise Orange. The shape of the black side panel outlined in gold was slimmer. Instrument faces changed to dark green. CB550K2 (1976); Candy Garnet Brown. The shape of the black side panel outlined in gold reverted to the 1974 style which was the same style as on the CB750. Instrument face color changed to light green. CB550K3 (1977); Candy Garnet Brown and Excel Black. The fuel tank side panel painted red with gold outline. 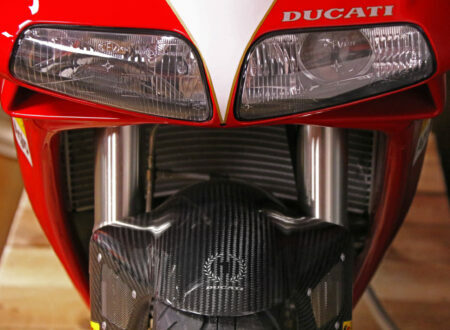 Side cover now given a “550 Four K” emblem. This model introduced the fuel filler placed under a locking top cover flap, sometimes called the “bathtub filler”. This change was made to suit the US market. CB550K4 (1978); Candy Alpha Red and Excel Black. Side cover given a gold pinstripe. Seat design changed to a dual contour style. The CB550F is without doubt the nicer of the two models. The CB550F was the “Super Sport” model and it was more of a conservative café racer style without the emphasis on the “racer” part. The CB550F featured slightly lower handlebars, rising only about two inches above the head stock. So the riding position is a little more leaning forward but comfortable, and perhaps better when you are up at motorway speeds. The aesthetics of the CB550F are what really sets it apart however. This bike has minimal chrome, simple plain paintwork on the tank and side plates, and a four into one exhaust system that manages to look a whole lot more businesslike than the two either side of the CB550K. The four into one exhaust system improves the aesthetics of the bike but its bulk does mean that it is possible to scrape the pipe on the tarmac if you are cornering at a foot-peg sparking lean. For brisk cornering the CB550F preferred gear-changing being done before a corner with progressive acceleration through it. Attempting to enter a corner whilst still braking and changing gear tended to result in a wiggle in the tail end as a bit of a reminder that the CB550F is a sporting motorcycle, not a racing motorcycle. CB550F0 (1975); Candy Sapphire Blue and Flake Sunrise Orange. “550 Four” decal on side panel. Dark green instrument faces. 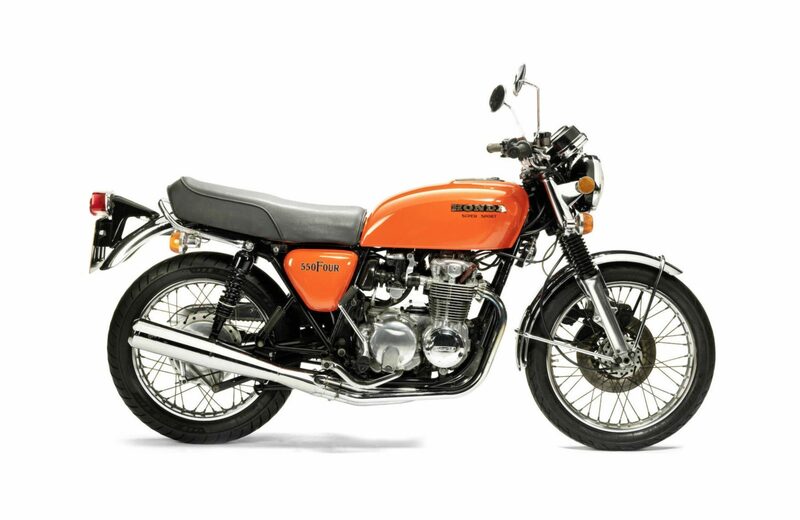 CB550F1 (1976); Flake Sapphire Blue and Shiny Orange (note: same colors as for 1975 but different names). Dark brown seat and light green instrument faces. CB550F2 (1977); Candy Sword Blue and Candy Presto Red. Gold tank stripe with side covers painted plain black. Black seat. Fork boots no longer used. The Honda CB550 is one of the most nicest and most practical motorcycles to emerge from Honda’s factories – period. It was a well thought out, easy to ride and thus easy to enjoy motorcycle that combined Honda’s reputation for “boring reliability” with good handling and a relatively light weight. 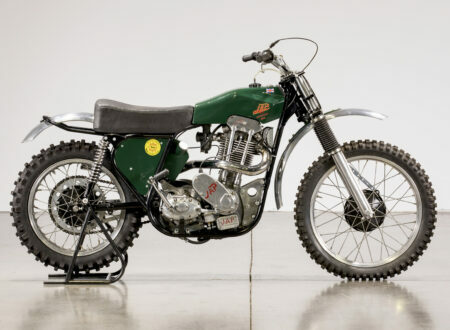 If you were looking for a motorcycle with all the conveniences of a Honda that was not a lightweight toy, nor a heavyweight superbike, but a bike that was just right, then this was the bike to buy. That remains true today and a CB550 in good condition is going to be an excellent choice. 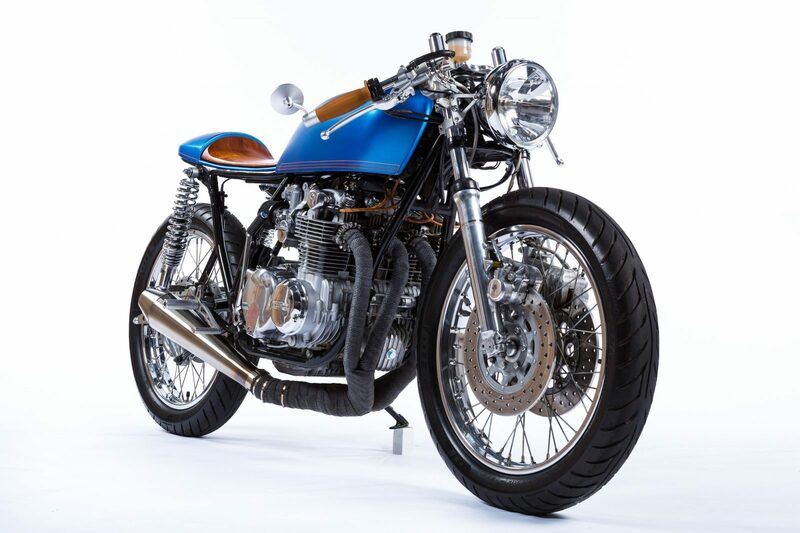 They also make a great base for a custom bike project although we personally think the CB550F models are so good-looking they don’t really need tweaking.